Our 2016 album Sharpener went straight into the jazz charts at number 3 thanks to your incredible support. We are an independent band without the support of a major label, so word of mouth and your support really counts. If you want to be the first to hear the new record when it's released, as well as supporting independent music, please do pre-order here (iTunes) or here (physical/download). We are releasing one teaser video a week until the album comes out. Check them out below. After the stunning success of their critically-acclaimed third album Sharpener, London’s brass juggernauts Hackney Colliery Band blaze back onto the scene with their first live album, released 12th May via Veki. With BBC Radio 2 describing them as “one of the best live bands we have in this country”, their live shows have become legendary, selling out venues across the UK and Europe, and playing main stage festival shows (Womad, Wilderness, Love Supreme, Field Day) to huge popular and critical acclaim. Recorded over three shows in 2016 and early 2017, the recording captures the band on peak form. Playing largely original material from Sharpener and their second album Common Decency, they also dust off some crowd favourites including their unique mash up of Prodigy covers, rousing versions of Blackstreet’s No Diggity and Nirvana’s Heart-Shaped Box, and concluding with an acoustic version of Toto’s Africa as they parade through the crowd at the end of the set. Hearing the band playing live is a very different experience from listening to their three studio albums; it becomes immediately obvious that, far from locked-down studio heads, these are some serious jazz improvisers, here stretching out on extended solos, and with a restless energy for pushing the groove and form in new directions. But this consummate musicianship and skill is always worn very lightly: the band have always managed to present complex music in an extremely playful, fun way, and to a very broad demographic, which on these recordings takes in young east London hipsters and Oxfordshire retirees with equal ease. Front man Steve Pretty’s interactions with the crowd, particularly towards the end of the set, raise the energy levels still further, and those with a good ear can listen out for some heart-warming moments from the audience, like the somewhat slurry man a little bit too close to the sound desk microphone singing along to Heart-Shaped Box, or the room gradually falling silent during the mesmerising introduction to the album’s only ballad Reawake. And it’s these quirks, these little imperfections, that make this album special. Rather than going through the recordings with a fine- tooth comb removing the trumpet cracks, sax squeaks or drum mishits which are inevitable in a 90-minute power set with seven brass musicians and two drummers, the production is minimal. This gives a rare ‘warts and all’ insight into how the band sound live. Steve Pretty, the band’s frontman said: “We’ve always prided ourselves on putting on a really great live show, and the exciting thing about live gigs is that anything can happen. Unfortunately, that means that if I missed a note somewhere, that will now live with me and annoy me forever, but we wanted a really honest portrayal, with no overdubs or excessive production, just capturing the energy of the room”. With the brass band revival in full swing, Hackney Colliery Band manage to occupy their own very distinctive space. Washes of Scandinavian-influenced electronica collide with extended contemporary jazz improvisation, dancefloor-friendly beats contrast with pounding rock rhythms, and Balkanesque melodies nestle up against soul and hip hop grooves. This set owes as much to modern European jazz and American alternative rock as it does to New Orleans second lines or the traditional British brass bands to which their name pays tribute. 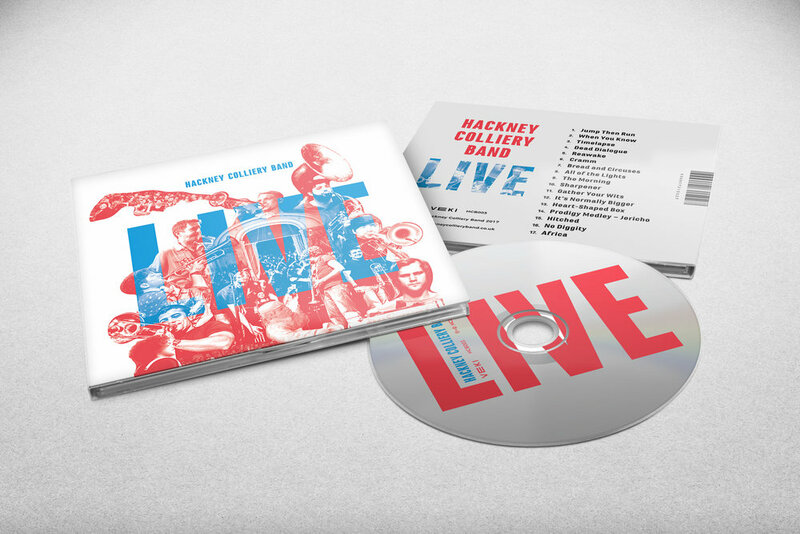 To celebrate the release of this unique live record, Hackney Colliery Band are playing their biggest headline show to date when they hit the legendary KOKO in London on 26th May. With all of their recent London shows selling out months in advance, including the 800-capacity Village Underground, and a few surprises and tricks up their sleeve, their KOKO show will undoubtedly be a real highlight of 2017, and a chance for fans to hear the real thing in person in one of London’s most iconic venues. Produced by Steve Pretty, Luke Christie and Olly Blackman. Recorded at Village Underground, London, 17th November 2016 (1, 6-11, 13-17), Wilton’s Music Hall, London, 13th May 2016 (5) and Cornerstone, Didcot, 27th January 2017 (2-4, 12).